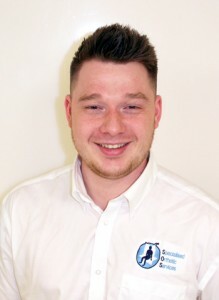 SOS are pleased to welcome Harvey Smart to our team of Clinic Managers. An experienced rehabilitation engineer. Harvey joined SOS at the start of 2015, his role is to prescribe and supply specialist seating and wheelchair products through NHS and private clinics. Harvey started training 6 years ago at Coventry University where he was part of the first group to complete the BSC (Hons) in Rehabilitation Engineering. He also received an additional Graduation diploma in Assistive Technology. Previously, Harvey worked for Coventry Wheelchair Services, prescribing wheelchairs and power chairs for children and adults. During this time he became a registered Clinical Technologist (RCT) – Allowing him to prescribe wheelchairs through the NHS. He then moved on to work with Warwickshire Wheelchair Services in a similar role whilst working for the Regional Posture and Mobility Service for 2 days of the week. During this time Harvey worked with more complex clients. Mark Shaw, Senior Clinic Manager explains: “Harvey is currently being trained in our seating design and manufacture processes adding to his skills as a rehabilitation engineer making him an excellent addition to our team. Welcome to Specialised Orthotic Services”. Recently I met Harvey during my wheelchair services appointment to decide how my new power chair can give me the best possible solution to my complex postural and seating needs. As a 20 year old female these appointments aren’t always easy, I have to be hoisted and when doing so with strangers putting my trust into these individuals can be difficult. This being said, Harvey has a fantastic professional mannerism without being patronising and from first meeting I knew I was in fantastic hands. Harvey made sure I understood what my new chair offered, made sure I was happy with the mouldings and I really did feel my needs were top priority. Harvey took the time to explain how the 3D scanning of the mould was taken as this is something I find really interesting. He took the extra time to ensure I had two separate moulds, to accommodate my hip to toe braces, something that could have quite easily been missed to save time and costs. As a young person with disability and complex medical needs it is really important to feel that you are both listened to and treated respectfully and I could not have asked for Harvey to do this any more than he did- it was a fantastic experience. Thank you Harvey for another brilliant experience with SOS, you certainly share the same empathetic, hardworking, considerate and overall positive mannerisms found throughout the SOS team!